“If we get a good fire here, you could lose the block,” Boston Fire Marshal Jack Dempsey said. National Grid’s intense labor dispute, along with the state’s ban on non-emergency work, has created chaos for builders, struggling to complete projects without gas line connections. And their solution is making first responders very nervous. When National Grid locked out workers in June, work on gas lines slowed to a snail’s pace. National Grid’s labor dispute has created chaos for builders, struggling to complete projects without gas line connections. “Things kind of stopped,” developer Jason Kahan said as he walked through his East Boston condominium building. It’s all but done. Brand new flooring, appliances and countertops. But it’s missing one crucial piece: heat. “When the gas stopped, the bank stopped financing. The sub-contractor stopped getting paid. And people stopped showing up to the job,” he said. National Grid’s intense labor dispute, along with Massachusetts' ban on non-emergency work, has created chaos for builders, struggling to complete projects without gas line connections. And their solution is making first responders very nervous. Boston Fire is on high alert, after the natural gas crisis forced them to allow homeowners and developers to temporarily install propane tanks to keep their properties warm. Here is information you should know about propane. Kahan said that tenants could have moved into the 19-unit complex in August, but the local natural gas crisis has prevented him from hooking up to the gas line, leaving his multi-million dollar project in the cold, and in jeopardy of becoming a total loss. The only thing between him and that catastrophe? A diesel heater, generating just enough heat to keep his building from falling to ruin. But not enough heat to get the sprinkler system and fire alarm running, both of which are required by state law. Kahan is just one of the hundreds of developers who are caught in the crossfire of an ongoing crisis within the local natural gas industry. When National Grid locked out workers in June, work on gas lines slowed to a snail’s pace. Coupled with the state’s ban on all but emergency work following the Merrimack Valley explosions and a high-pressure scare in Woburn, it has been impossible for developers to get new gas line connections to their projects. While the state lifted the ban on Wednesday, the labor dispute is still ongoing and developers are left to wonder if there will be any workers to connect gas lines. Not to mention the backlog of projects needing hook-ups, which one expert says could take up to two years to finish. “People are desperate,” Kahan said. Contractors aren’t the only ones holding their breath. “We’d certainly be concerned with an explosion,” Boston Fire Marshal Jack Dempsey said. He said Boston Fire is on high alert, after the natural gas crisis forced them to allow homeowners and developers to temporarily install propane tanks to keep their properties warm. It’s one of their only options for heat while they wait for the lockout to end. Allowing propane tanks is an unprecedented move for Boston Fire. They didn’t issue a single permit last year. But in the last six weeks, they’ve already approved just over 40. Most of these tanks are going to densely populated neighborhoods, where the risk of a fire spreading is already considerable. Add in the chance of a propane-fueled explosion, and the city’s fire marshal says a disaster could strike hard. “If we get a good fire here, you could lose the block,” he said. According to a four-year study by the National Fire Prevention Association, propane was responsible for nearly as many fires—13,340—on average per year during that time as natural gas—13,730. And although not distinguished in the data, some of those fires were likely were caused by propane tanks in barbeques. As for casualties, propane fires were found to be more deadly, resulting in 47 deaths, versus 35 for natural gas, and 349 injuries versus 254. But propane is heavier than air, causing it to linger and form pools near the ground. That creates an issue when it lingers long enough to find an ignition source, which are often found in basements. On top of that, Boston’s first responders are concerned about all the extra manpower and overwhelming evacuations it would take to respond to a leak—or worse yet, a fire. And although Jason Kahan wishes there was an alternative, he is planning on installing a propane tank at his East Boston condo project. 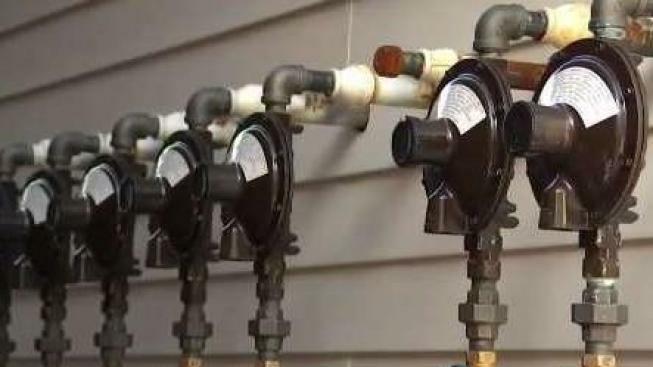 He says that he is willing to take the risk of propane in order to get his sprinkler system up and running, but thinks there should be better options for the hundreds of developers waiting out in the cold. “There should be some kind of means for the life safety while everything’s getting figured out,” he said. In the meantime, developers are counting on these propane tanks to protect their property. But the permits are temporary. They’re only for six months, and mandate that tanks must be above-ground outside. Large properties are required to have 24/7 security. And since no one knows how long the lockout will last, the permits may have to be renewed.